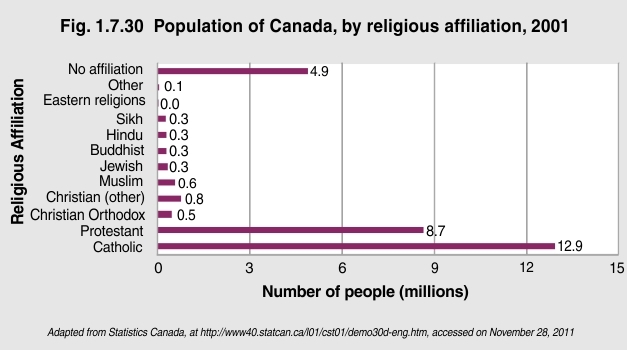 The 2001 Census categorized religions among Canadians into 12 affiliations, including a category for non-believers and/or people who do not subscribe to an organized faith. In 2001, 12.9 million people, or 44% of the total population, identified as Catholic; 8.7 million people, or 29% of the total population, identified as Protestant; almost 500,000, or 2% of the population, reported being Christian Orthodox; and another 780,000, or 3% of Canadians, belonged to a different Christian sect. Collectively, 77% of all Canadians identified with one of these four Christian denominations. Several religious minorities were reported as well. Almost 600,000 people, or 2% of the population, identified as Muslim; 329,995 people, or 1% of the population, identified as Jewish; 300,345 (1%) identified as Buddhist; 297,200 (1%) identified as Hindu; and 278,410 (1%) identified as Sikh. The largest minority, consisting of almost 5,000,000 Canadians, or 17% of the total population, reported no religious affiliation. Religion and faith play a central role in the lives of many Canadians, though not all. Canadians who subscribe to any one of several religions may practice their faiths to varying degrees. Religion is important because it can influence the core values and beliefs of a person or a group, which in turn can affect his/her/their community life. Religion can determine whether a child is enrolled in public versus Catholic schools, political persuasion, dietary practices and observation of religious holidays, to cite a few examples. Degree of religiosity also affects social integration and carries implications for the debate about “reasonable accommodation” of religious minorities. As Canada welcomes an increasing number of immigrants each year, making religious accommodations for people of faith is a contentious issue and an increasingly important one. Regrettably, no new data has been collected on Canadians and religions since the 2001 Census.